The Pastel Society of Southern California is pleased to announce our first exhibition of 2019 in celebration of our Society’s 10th Anniversary. PSSC members will have the opportunity to participate in this exhibition and show off their work at this beautiful venue! 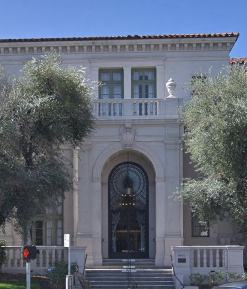 The Ebell of Los Angeles is one of the oldest and largest women’s clubs in the United States. The show will take place in the Ebell Clubhouse, a historic landmark building with a dedicated Art Salon. The cost of entry is $35 for up to two images. Entries will be juried in anonymously by our Special Invited Juror, Karen Margulis. Thursday, April 18, 6-8 p.m. -- Show gala reception at Ebell of Los Angeles, 741 S. Lucerne Blvd., Los Angeles, CA 90005. Phone: 323-931-1277. The reception will take place in the Art Salon. Free parking available in the Ebell lot across the street. Friday, May 24 - Show ends at 5 p.m.
For more complete information, download the Pastel at the Ebell Prospectus.